Infusion rate is one of essential elements that should be included in all intravenous orders or prescriptions according to the Joint Commission International (JCI) Accreditation Standards for Hospitals, sixth edition.1 Numerous sporadic clinical studies have been conducted to evaluate the effects of infusion rates on therapeutic and economic outcomes of drug therapy, and the new findings have challenged the regular infusion regimen. Health care-associated infections, alongside increasing antimicrobial resistance, pose significant burdens to the hospital system.2 More aggressive dosing strategies, such as prolonged and continuous infusion of β-lactam antibiotics, are applied to address the tremendous challenges associated with the difficult-to-treat pathogens and increase the probability of attaining pharmacokinetic/pharmacodynamic (PK/PD) targets predictive of successful clinical outcomes. Clinicians who have a thorough understanding of appropriate antibiotic use and dosing regimens are essential in the battle to preserve the usefulness of antibiotics and prevent further antibiotic resistance.3,4 In this article, based on the literature in the latest 5 years, we share our perspectives in rational intravenous rates of antimicrobial agents and hope to bring some implications for clinical practice and research. Inclusion criteria included studies comparing the outcomes of different infusion regimens focusing on infusion rates. Exclusion criteria included documents with actually irrelevant topics on antimicrobial therapy, despite being retrieved using the search terms, studies without comparison of outcomes at different intravenous infusion rates of antimicrobial agents, studies lacking a control group with different infusion rates, and documents such as comments, letters, reviews, case reports, editorials, and descriptive studies without statistical analysis. Fifty-three papers were finally chosen according to the inclusion/exclusion criteria. The PRISMA flowchart is illustrated in Figure 1. The full text of each include article was critically reviewed, and valuable information was summarized by data interpretation. Figure 1 The flowchart of literature selection. Two meta-analyses confirmed the advantages of continuous or prolonged infusion of β-lactam antibiotics. Roberts et al5 performed a meta-analysis of 632 critically ill patients with severe sepsis from three randomized trials, and concluded that administration of β-lactam antibiotics by continuous infusion was associated with decreased hospital mortality (19.6% vs 26.3%; relative risk=0.74; P=0.045) and improved clinical cure (55.4% vs 46.3%; relative risk=1.20; P=0.021) compared with intermittent dosing. Teo et al6 conducted a meta-analysis of 29 studies with 2,206 patients and observed that use of prolonged infusion of β-lactam antibiotics appeared to be associated with a significant reduction in mortality (relative risk=0.66) and improvement in clinical success (relative risk=1.12) in hospitalized adult patients compared with intermittent boluses. Abbreviations: CPKP, carbapenemase-producing Klebsiella pneumoniae; h, hours; ICU, intensive care unit; LOS, length of stay; MIC, minimum inhibition concentration; min, minutes; PK/PD, pharmacokinetic/pharmacodynamic; PTA, probability of target attainment; SOFA, sequential organ failure assessment; T>MIC, time for which drug concentrations exceed the MIC. Ibrahim et al20 compared the efficacy of imipenem in adult ICU patients with ventilator-associated pneumonia (VAP) following regular infusion over 30–60 minutes (first year of the study) or 3-hour extended infusion (second year of the study). Extended infusion resulted in a significant decrease in mortality, number of recurrent infections, ICU LOS, and the number of mechanical ventilator days. Suchánková et al21 evaluated the population pharmacokinetics of imipenem in adult critically ill patients with hospital-acquired pneumonia (HAP). The 3-hour infusions and continuous infusion achieved over 97% of cumulative fraction of response (CFR) against all pathogens, with the exception of Pseudomonas aeruginosa and Acinetobacter spp., where the maximum CFRs were 85.5% and 88.4%, respectively. The 3-hour extended infusions and continuous infusion achieved higher probability of target attainment (PTA) for the targets of achieving fT>MIC for 40% and 100% of the dosing interval as PK/PD targets compared with 0.5-hour infusions; however, continuous infusion carried a risk of not reaching the MIC of less susceptible pathogens in a higher proportion of patients. Therefore, it may be necessary to use maximum doses administered as extended infusions in critically ill patients with HAP and risk factors for Gram-negative non-fermenting bacteria. The benefit of prolonged infusion vs standard infusion of imipenem may be related with drug dose and MIC of bacterial pathogens. Lipš et al22 compared the PK/PD indices of imipenem administered by standard infusion (1 g imipenem/1 g cilastatin over 30 minutes every 8 hours) and extended infusion with a reduced total dose (0.5 g imipenem/0.5 g cilastatin over 3 hours every 6 hours) in critically ill patients with nosocomial pneumonia. 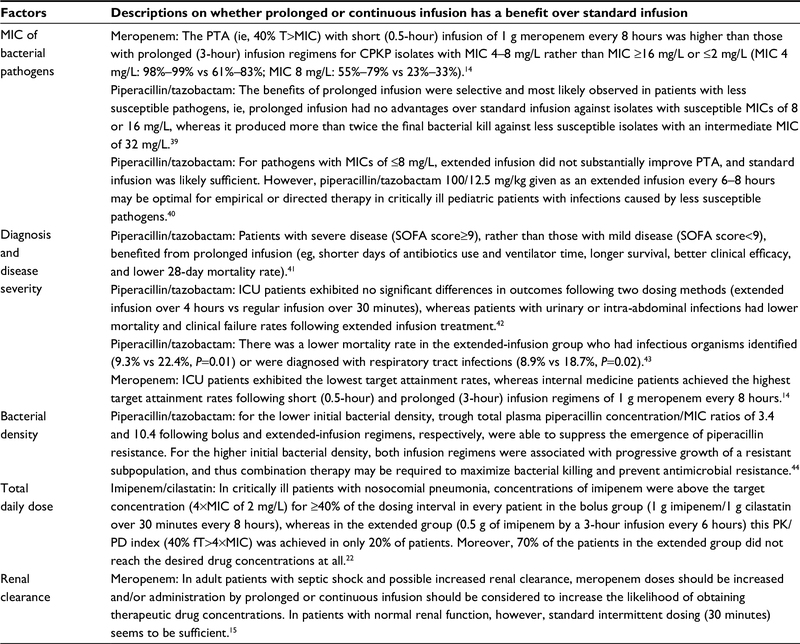 Concentrations of imipenem were above the target concentration (4×MIC of 2 mg/L) for ≥40% of the dosing interval in every patient in the bolus group, whereas in the extended group this PK/PD index (40% fT>4×MIC) was achieved in only 20% of patients. Moreover, 70% of the patients in the extended group did not reach the desired drug concentrations at all. For a MIC of 4 mg/L, only one patient in the bolus group achieved 40% fT>4×MIC, and the rest of the patients still at least reached concentrations above 4×MIC, whereas none of the patients in the extended group reached these concentrations. Therefore, administration of 0.5 g of imipenem by a 3-hour infusion every 6 hours could not provide adequate drug concentrations to control infections caused by pathogens with MIC≥2 mg/L. In empirical treatment where the presence of a less sensitive micro-organism cannot be excluded, the strategy of concomitantly reducing total daily dose and prolonging infusion time may cause treatment failure. Prescribing information for ertapenem specifies that the drug should be infused over a period of 30 minutes when administered intravenously. Wiskirchen et al24 showed that ertapenem 1 g administered as a rapid 5-minute infusion could provide a well-tolerated, bioequivalent, and pharmacodynamically equivalent regimen to the 30-minute infusion at clinically relevant MICs in healthy adult volunteers. The estimated PTA was greater than 90% when using a bactericidal target of 40% fT>MIC up to an MIC of 0.25 mg/L for both infusion times. Additional studies in infected patients are needed to determine the safety and value of rapid 5-minute infusion of ertapenem. A retrospective quasi-experimental study showed that the extended infusion (a 4-hour infusion of 2 g cefepime every 8 hours) rather than standard infusion (a 30-minute infusion of 2 g cefepime every 8 hours) resulted in significantly lower overall mortality, reduced hospital costs, and significantly shorter LOS in the treatment of P. aeruginosa infections in adult ICU patients.25 However, a newer study did not confirm the superiority of extended infusion of cefepime.26 Wrenn et al26 compared the outcomes between extended infusion and standard infusion of cefepime as empiric treatment of febrile neutropenia in adult patients admitted to a hematology/oncology service and observed no statistically significant differences in defervescence by 72 hours and secondary outcome measures (time to defervescence, clinical success, in-hospital mortality, hospital LOS, and need for additional antimicrobials). Cousson et al28 confirmed the advantages of continuous infusion (loading dose of 20 mg/kg followed by 60 mg/kg/day) over intermittent infusion (20 mg/kg over 30 minutes every 8 hours) in terms of pharmacodynamics and predictable efficacy in adult patients with VAP due to Gram-negative bacilli. The %T>MIC of ceftazidime (MIC=20 mg/L) was 100% and 46%, respectively, following continuous infusion and intermittent infusion (P<0.003). There were four studies involving the pharmacoeconomic issues of extended infusion vs intermittent infusion of piperacillin/tazobactam. Brunetti et al35 showed that automatic substitution of extended infusion for standard infusion of piperacillin/tazobactam in adult patients could reduce total cost per treatment course by 13%, with no difference in LOS and in-hospital mortality between two groups. Compared with regular infusion in the pre-intervention phase, post-implementation of an extended infusion dosing protocol resulted in a significant shorter ICU and hospital LOS and a significantly reduced cost of therapy ($120.21 vs $155.17; P=0.035), although there was no significant difference in the primary end-point of mortality and adverse drug effects between the two phases.36 Bao et al37 showed better PK/PD and pharmacoeconomic parameters following 3-hour extended infusion of piperacillin/tazobactam vs 30-minute intermittent infusion every 6 hours in the treatment of HAP in adult critically ill patients with low illness severity. Extended infusion achieved a lower therapy cost ($1,351.72 vs $1,782.04, P=0.001), and higher %fT>MIC (~100, 98.73, and 93.04% in the extended infusion group vs 81.48, 53.29, and 42.15% in the intermittent infusion group, respectively, for the pathogen with an MIC of 4, 8, and 16 mg/L), although the clinical success rate, clinical failure rate, and drug-related adverse events did not significantly differ between groups. Cotrina-Luque et al38 confirmed similar efficacy and safety of continuous infusion of piperacillin/tazobactam to intermittent infusion in treating P. aeruginosa infection; however, continuous infusion (an initial loading dose of piperacillin/tazobactam 2/0.25 g in 100 mL of saline solution for 30 minutes, immediately followed by continuous infusion of piperacillin/tazobactam 8/1 g in 500 mL of saline over 24 hours) could lead to system cost savings due to utilizing a 30% lower dose of piperacillin/tazobactam than intermittent infusion (an initial dose of piperacillin/tazobactam 4/0.5 g in 100 mL of saline solution for 30 minutes, followed by piperacillin/tazobactam 4/0.5 g in 100 mL of saline for 30 minutes every 8 hours). Zelenitsky et al39 characterized the pharmacodynamics of prolonged-infusion piperacillin/tazobactam in an in vitro pharmacodynamic model of P. aeruginosa. The benefits of prolonged infusion were selective and most likely observed in patients with less susceptible pathogens, ie, prolonged infusion had no advantages over standard infusion against isolates with susceptible MICs of 8 or 16 mg/L, whereas it produced more than twice the final bacterial kill against less susceptible isolates with an intermediate MIC of 32 mg/L. Nichols et al40 evaluated the population PK/PD profiles for dosing regimens of 80–100 mg/kg of the piperacillin component given every 6–8 hours and infused over 0.5, 3, or 4 hours in critically ill children. At the pharmacodynamic target of a T>MIC of ≥50%, all simulated dosing regimens achieved a PTA of >90% at MICs of ≤8 mg/L. Only 0.5-hour infusion regimens of 80–100 mg/kg every 8 hours did not achieve a PTA of >90% at a MIC of 16 mg/L. All extended-infusion regimens achieved PTAs of >90% at MICs of ≤16 mg/L; however, only the 3-hour infusion regimens given every 6 hours achieved PTAs of >90% at a MIC of 32 mg/L. At the pharmacodynamic target of a T>MIC of 100%, none of the regimens achieved a PTA of >90% at a MIC of ≥16 mg/L, and only 100 mg/kg given every 6 hours and infused over 3 hours achieved a PTA of >90% at a MIC of 8 mg/L. For pathogens with MICs of ≤8 mg/L, extended infusion did not substantially improve PTA, and standard infusion was likely sufficient. However, piperacillin/tazobactam 100/12.5 mg/kg given as an extended infusion every 6–8 hour may be optimal for empirical or directed therapy in critically ill pediatric patients with infections caused by less susceptible pathogens or if the desirable T>MIC is greater than 50%. Lyu et al41 investigated the infusion modes of piperacillin/tazobactam guided by SOFA score in cancer patients with postoperative HAP. Compared to conventional infusion (30 minutes), prolonged infusion improved patient survival, increased clinical efficacy and bacteriologic efficacy, and reduced 28-day mortality (P<0.05). However, patients with severe disease (SOFA score≥9), rather than those with mild disease (SOFA score<9), benefited from prolonged infusion (eg, shorter days of antibiotics use and ventilator time, longer survival, better clinical efficacy and lower 28-day mortality rate). Bacterial burden may exert a significant influence on the ultimate outcome of antimicrobial therapy. Felton et al44 used a hollow-fiber infection model with P. aeruginosa to examine the impact of administering piperacillin/tazobactam by 0.5 hour bolus dosing or 4 hours extended infusion every 8 hours on the emergence of piperacillin resistance. Both infusion methods resulted in comparable antibacterial activities and rates of emergence of antimicrobial resistance. For the lower initial bacterial density, trough total plasma piperacillin concentration/MIC ratios of 3.4 and 10.4 following bolus and extended-infusion regimens, respectively, were able to suppress the emergence of piperacillin resistance. For the higher initial bacterial density, both infusion regimens were associated with progressive growth of a resistant subpopulation, and thus combination therapy may be required to maximize bacterial killing and prevent antimicrobial resistance. Prescribing information for nafcillin specifies that the drug should be administered slowly as an intravenous infusion over at least 30–60 minutes at the adult dose of 500 mg to 1 g every 4 hours. Bauer et al45 compared the clinical efficacy and incidence of acute interstitial nephritis or acute renal failure between nafcillin intermittent (2 g every 4 hours for 30 minutes) vs continuous (6 g every 12 hours twice daily) infusion in patients with methicillin-sensitive Staphylococcus aureus bacteremia. Results showed no difference in the safety and efficacy between two infusion methods. de Pascale et al47 compared linezolid concentrations in plasma and epithelial lining fluid following administration in obese critically ill patients with VAP by 60-minute intermittent (600 mg every 12 hours) and continuous infusion (600 mg intravenous loading dose infused over 60 minutes, followed by 1,200 mg continuous infusion over 24 hours). Continuous infusion resulted in a significantly longer median time of linezolid plasma concentration persisted above MIC ranging from 1–4 mg/L and a higher epithelial lining fluid/plasma penetration ratio (98.8% vs 87.1%; P<0.001) compared with intermittent infusion. Tafelski et al48 compared the effects of different dosing regimens on vancomycin target levels in critically ill patients. Intermittent administration in adults was as follows: 500 mg vancomycin every 6 hours given over 1 hour or 1 g every 12 hours given over 1 hour. The continuous infusion regimen was as follows: initiation of therapy with 1 g vancomycin as an infusion given over 1 hour, followed by 24 hour-continuous infusion of 1 g vancomycin in 50 mL of solution at different infusion rates (normal renal function: 4.2 mL/h; impaired renal function and CrCl of <50 mL/min: 2.1 mL/h; impaired renal function and CrCl of <20 mL/min: 1 mL/h). Patients with continuous administration achieved target serum levels significantly earlier and showed fewer sub-therapeutic serum levels (41% vs 11%, P<0.001). Hanrahan et al53 conducted a meta-analysis of seven studies of vancomycin administration by continuous vs intermittent infusion and identified a non-significant trend of reduced nephrotoxicity in those who received vancomycin by continuous infusion (risk ratio=0.799, P=0.299). However, a newer meta-analysis of eleven studies by Hao et al54 revealed that patients treated with continuous infusion of vancomycin had a significantly lower incidence of nephrotoxicity compared with patients receiving intermittent infusion (relative risk=0.61, P<0.001), whereas the clinical efficacy was not significantly different. Wu et al55 failed to observe significant advantages of a continuous infusion method of norvancomycin (ie, 0.8 g norvancomycin for 1 hour, and then another 0.4 g for 11 hours with extended infusion, followed by continuous infusion of 0.4 g for 12 hours) over the conventional infusion method (ie, 0.8 g norvancomycin for 1 hour every 12 hours) in an early stage after neurosurgery. The cerebral spinal fluid concentration in both groups reached or exceeded the MIC90 (2 mg/L) of target bacteria such as methicillin-resistant Staphylococcus aureus (MRSA). This pilot study of norvancomycin in a neurosurgical individual needs to be confirmed by further large-scale studies. Albiero et al56 evaluated treatment regimens of the meropenem-fosfomycin combination against carbapenemase-producing Klebsiella pneumoniae (CPKP). For the 0.5-hour infusion, fosfomycin monotherapy regimens did not achieve a 90% PTA of >70% fT>MIC against the MIC50 or MIC90 in patients with normal renal function. Prolonged infusion of fosfomycin over 3 hours improved the PTA over that of a 0.5-hour infusion, however, fosfomycin monotherapy regimens did not reach 90% PTA against either the MIC50 or the MIC90 in patients with normal renal function. In combination therapy of meropenem, fosfomycin 6 g every 6 hours or 8 g every 8 hours as a 3-hour infusion had better chances of achieving PTA. Prescribing information for voriconazole (Vfend®; Pfizer Inc.) requires a maximum infusion rate of 3 mg/kg per hour over 1–2 hours. Hohmann et al57 observed that infusion rate could modulate voriconazole pharmacokinetics. Maximum concentration after a 4-hour infusion, and after a 6-hour infusion was 29% and 51% lower compared to a 400 mg/2-hour infusion, and fell outside of the bioequivalence margins (0.80–1.25). The AUC of 400 mg intravenous voriconazole was 16% lower when administered over 6 hours compared to 2 hours infusion. Metabolic clearance of CYP3A probe midazolam was 516 mL/min following 100 mg/4 hours voriconazole, 152 mL/min for 400 mg/6 hours, 192 mL/min for 400 mg/4 hours, and 202 mL/min for 400 mg/2 hours, which reflected an auto-inhibitory effect on CYP3A4-mediated voriconazole metabolism. Voriconazole efficacy correlates well in vivo with the AUC/MIC or mean unbound voriconazole concentration/MIC ratio.58 Thus, to avoid reduced exposure and potential efficacy, infusion rate of voriconazole should not deliberately be prolonged. When implementing the prolonged or continuous infusion of antimicrobial therapy, several pragmatic issues should be considered, including availability of intravenous catheters, compatibility of intravenous drugs, drug stability, safety concerns, monitoring for efficacy and toxicity, and timing of administration. Critically ill patients often receive multiple drugs via continuous intravenous infusion. Intravenous drugs may be infused concurrently via Y-site when compatibility data are available. For example, vancomycin was stable during the whole process and also during 72 hours exposure of concentrated solutions at temperatures up to 37°C, but careful attention must be paid to incompatibilities with β-lactams (temocillin, piperacillin/tazobactam, ceftazidime, imipenem, cefepime, and flucloxacillin), moxifloxacin, propofol, valproic acid, phenytoin, theophylline, methylprednisolone, and furosemide.59 For combination therapy of cefepime and vancomycin, worries about incompatibility between two antibiotics would result in conventional practice (ie, flush the tube with diluent and initiate vancomycin infusion when cefepime infusion over 30–60 minutes is completed). Tran et al60 evaluated whether an intravenous push of cefepime (a mixture of 10 mL normal saline injected over 2–5 minutes) was associated with a shorter time to vancomycin administration in the emergency department compared with intravenous piggyback infusion (a mixture of 100 mL normal saline infused over 30–60 minutes). The transition from intravenous piggyback infusion to intravenous push of cefepime could statistically significantly decrease the time to initiation of vancomycin administration by more than 1 hour to patients with suspected infections who were ordered both antibiotics. To prevent delay to MRSA coverage with vancomycin in the emergency department, it is reasonable to administer the first dose of cefepime as an intravenous push. There are many further opportunities in research and clinical practice with respect to optimal infusion rate in antimicrobial therapy. First, it is necessary to conduct head-to-head comparative studies of infusion regimens with different infusion rates from multiple perspectives (eg, clinical outcomes, resources utilization, nurse satisfaction, cost-effectiveness). Second, dosing and administration strategies should be individualized on the basis of the pathogen–drug–patient interplay to optimize outcomes. For time-dependent antimicrobials, the factors affecting the indice %T>MIC or %fT>MIC (eg, dose, dosing frequency, infusion rate, MIC value, protein binding, clearance alternations) may have an influence on the difference between two infusion methods. In this review, the factors determining whether prolonged or continuous infusion has a benefit over standard infusion are summarized in Table 2. Therefore, subgroup analysis in specific circumstances and populations should be encouraged, and their findings may provide explanations for the inconsistency of conclusions derived from outcome comparison between extended infusion and standard infusion of antimicrobials. Also, there may be a very pronounced difference in PK/PD of antibiotics in neonates and adults; therefore, the conclusion drawn from adult studies could not be simply extrapolated to neonates or pediatric patients. Abbreviations: CPKP, carbapenemase-producing Klebsiella pneumoniae; ICU, intensive care unit; MIC, minimum inhibition concentration; PK/PD, pharmacokinetic/pharmacodynamic; PTA, probability of target attainment; SOFA, sequential organ failure assessment; T>MIC, time for which drug concentrations exceed the MIC. Fourth, prescribing information on the infusion rate of some medications should be revised according to the updated evidence. Clinicians may not dare to prescribe and administer antimicrobial agents with new infusion strategies due to potential medical disputes and hidden dangers caused by off-label use. To maximally preserve the effectiveness of current antimicrobials and prevent further antimicrobial resistance, effective interventions should be implemented to enhance the application of optimal infusion strategies. For reducing nephrotoxicity, prolonged infusion of meropenem over 4 hours is better than the conventional infusion strategy (30 minutes) for meningitis and Pseudomonas infection in neonates with Gram-negative late-onset sepsis; and continuous infusion of vancomycin is superior to intermittent infusion. For increasing drug efficacy, prolonged or continuous infusion of time-dependent antibiotics (eg, meropenem, doripenem, imipenem, cefepime, ceftazidime, piperacillin/tazobactam, linezolid, and vancomycin) is an optimal choice. Extended infusion of piperacillin/tazobactam has pharmacoeconomic advantage over standard infusion. Nevertheless, the advantage of prolonged or continuous infusion vs regular infusion of time-dependent antibiotics may only exhibit in special clinical circumstance and special populations (eg, patients with SOFA score≥9, respiratory tract infections, urinary or intra-abdominal infections, or infections caused by less susceptible pathogens, benefited from prolonged infusion of piperacillin/tazobactam). This work was supported by Zhejiang Provincial Bureau of Education (grant nos. N20140209 and Y201635841). Also, we would like to thank Professor Xuan-ding Wang (Dean of the Department of Hospital Infection Management), Mr Jun-Shou (inpatient pharmacy supervisor), and Yang-min Hu (clinical pharmacist) for their kind participation in quality improvements in antimicrobial therapy. Joint Commission Resources. Joint Commission International accreditation standards for hospitals. 6th ed. Oak Brook, IL: Joint Commission Resources; 2017. Versporten A, Zarb P, Caniaux I, et al. Antimicrobial consumption and resistance in adult hospital inpatients in 53 countries: results of an internet-based global point prevalence survey. Lancet Glob Health. 2018;6(6):e619–e629. Guervil DJ, Chau T. Trends in multidrug-resistant gram-negative bacilli and the role of prolonged β-lactam infusion in the intensive care unit. Crit Care Nurs Q. 2013;36(4):345–355. Lutsar I, Telling K, Metsvaht T. Treatment option for sepsis in children in the era of antibiotic resistance. Expert Rev Anti Infect Ther. 2014;12(10):1237–1252. Roberts JA, Abdul-Aziz MH, Davis JS, et al. Continuous versus intermittent β-lactam infusion in severe sepsis. A meta-analysis of individual patient data from randomized trials. Am J Respir Crit Care Med. 2016;194(6):681–691. Teo J, Liew Y, Lee W, Kwa AL. Prolonged infusion versus intermittent boluses of β-lactam antibiotics for treatment of acute infections: a meta-analysis. Int J Antimicrob Agents. 2014;43(5):403–411. Arnold HM, Hollands JM, Skrupky LP, et al. Prolonged infusion antibiotics for suspected gram-negative infections in the ICU: a before-after study. Ann Pharmacother. 2013;47(2):170–180. Dulhunty JM, Roberts JA, Davis JS, et al. A multicenter randomized trial of continuous versus intermittent β-lactam infusion in severe sepsis. Am J Respir Crit Care Med. 2015;192(11):1298–1305. Abdul-Aziz MH, Sulaiman H, Mat-Nor MB, et al. Beta-Lactam Infusion in Severe Sepsis (BLISS): a prospective, two-centre, open-labelled randomised controlled trial of continuous versus intermittent beta-lactam infusion in critically ill patients with severe sepsis. Intensive Care Med. 2016;42(10):1535–1545. Shabaan AE, Nour I, Elsayed Eldegla H, Nasef N, Shouman B, Abdel-Hady H. Conventional versus prolonged infusion of meropenem in neonates with gram-negative late-onset sepsis: a randomized controlled trial. Pediatr Infect Dis J. 2017;36(4):358–363. Fehér C, Rovira M, Soriano A, et al. Effect of meropenem administration in extended infusion on the clinical outcome of febrile neutropenia: a retrospective observational study. J Antimicrob Chemother. 2014;69(9):2556–2562. Zhao HY, Gu J, Lyu J, et al. Pharmacokinetic and pharmacodynamic efficacies of continuous versus intermittent administration of meropenem in patients with severe sepsis and septic shock: a prospective randomized pilot study. Chin Med J. 2017;130(10):1139–1145. Mathew SK, Mathew BS, Neely MN, et al. A nonparametric pharmacokinetic approach to determine the optimal dosing regimen for 30-minute and 3-hour meropenem infusions in critically ill patients. Ther Drug Monit. 2016;38(5):593–599. Vourli S, Tsala M, Kotsakis S, et al. Comparison of short versus prolonged infusion of standard dose of meropenem against carbapenemase-producing Klebsiella pneumoniae isolates in different patient groups: a pharmacokinetic-pharmacodynamic approach. J Pharm Sci. 2016;105(4):1513–1518. Sjövall F, Alobaid AS, Wallis SC, Perner A, Lipman J, Roberts JA. Maximally effective dosing regimens of meropenem in patients with septic shock. J Antimicrob Chemother. 2018;73(1):191–198. Abdul-Aziz MH, Lipman J, Akova M, et al. Is prolonged infusion of piperacillin/tazobactam and meropenem in critically ill patients associated with improved pharmacokinetic/pharmacodynamic and patient outcomes? An observation from the defining antibiotic levels in intensive care unit patients (DALI) cohort. J Antimicrob Chemother. 2016;71(1):196–207. Pettit RS, Neu N, Cies JJ, et al. Population pharmacokinetics of meropenem administered as a prolonged infusion in children with cystic fibrosis. J Antimicrob Chemother. 2016;71(1):189–195. Langan KM, Jacob J, Li J, et al. Pharmacokinetics of short versus extended infusion meropenem dosing in critically ill patients: a pilot study. Crit Care Resusc. 2014;16(3):190–196. Hsaiky L, Murray KP, Kokoska L, Desai N, Cha R. Standard versus prolonged doripenem infusion for treatment of gram-negative infections. Ann Pharmacother. 2013;47(7–8):999–1006. Ibrahim MM, Tammam TF, Ebaed MED, Sarhan HA, Gad GF, Hussein AK. Extended infusion versus intermittent infusion of imipenem in the treatment of ventilator-associated pneumonia. Drug Des Devel Ther. 2017;11:2677–2682. Suchánková H, Lipš M, Urbánek K, Neely MN, Strojil J. Is continuous infusion of imipenem always the best choice? Int J Antimicrob Agents. 2017;49(3):348–354. 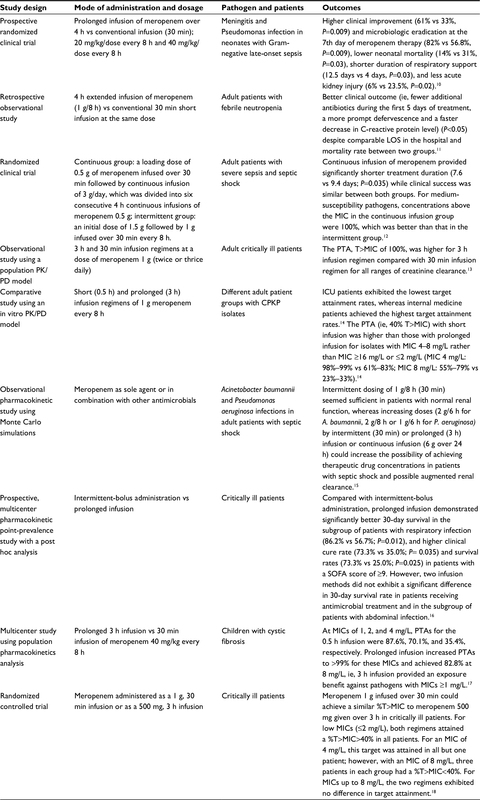 Lipš M, Siller M, Strojil J, Urbánek K, Balík M, Suchánková H. Pharmacokinetics of imipenem in critically ill patients during empirical treatment of nosocomial pneumonia: a comparison of 0.5-h and 3-h infusions. Int J Antimicrob Agents. 2014;44(4):358–362. Dong J, Xiong W, Chen Y, et al. Optimal dosing regimen of biapenem in Chinese patients with lower respiratory tract infections based on population pharmacokinetic/pharmacodynamic modelling and Monte Carlo simulation. Int J Antimicrob Agents. 2016;47(3):202–209. Wiskirchen DE, Housman ST, Quintiliani R, Nicolau DP, Kuti JL. Comparative pharmacokinetics, pharmacodynamics, and tolerability of ertapenem 1 gram/day administered as a rapid 5-minute infusion versus the standard 30-minute infusion in healthy adult volunteers. Pharmacotherapy. 2013;33(3):266–274. Wrenn RH, Cluck D, Kennedy L, Ohl C, Williamson JC. Extended infusion compared to standard infusion cefepime as empiric treatment of febrile neutropenia. J Oncol Pharm Pract. 2018;24(3):170–175. Huang H, Huang S, Zhu P, Xi X. Continuous versus intermittent infusion of cefepime in neurosurgical patients with post-operative intracranial infections. Int J Antimicrob Agents. 2014;43(1):68–72. Cousson J, Floch T, Guillard T, et al. Lung concentrations of ceftazidime administered by continuous versus intermittent infusion in patients with ventilator-associated pneumonia. Antimicrob Agents Chemother. 2015;59(4):1905–1909. Chan JD, Dellit TH, Lynch JB. Hospital length of stay among patients receiving intermittent versus prolonged piperacillin/tazobactam infusion in the intensive care units. J Intensive Care Med. 2018;33(2):134–141. Winstead EM, Ratliff PD, Hickson RP, Mueller JE, Judd WR. Evaluation of an alternative extended-infusion piperacillin-tazobactam dosing strategy for the treatment of gram-negative infections. Int J Clin Pharm. 2016;38(5):1087–1093. Shotwell MS, Nesbitt R, Madonia PN, et al. Pharmacokinetics and pharmacodynamics of extended infusion versus short infusion piperacillin-tazobactam in critically ill patients undergoing CRRT. Clin J Am Soc Nephrol. 2016;11(8):1377–1383. Jamal JA, Roberts DM, Udy AA, et al. Pharmacokinetics of piperacillin in critically ill patients receiving continuous venovenous haemofiltration: a randomised controlled trial of continuous infusion versus intermittent bolus administration. Int J Antimicrob Agents. 2015;46(1):39–44. McCormick H, Tomaka N, Baggett S, et al. Comparison of acute renal injury associated with intermittent and extended infusion piperacillin/tazobactam. Am J Health Syst Pharm. 2015;72(11 Suppl 1):S25–S30. Mousavi M, Zapolskaya T, Scipione MR, Louie E, Papadopoulos J, Dubrovskaya Y. Comparison of rates of nephrotoxicity associated with vancomycin in combination with piperacillin-tazobactam administered as an extended versus standard infusion. Pharmacotherapy. 2017;37(3):379–385. Brunetti L, Poustchi S, Cunningham D, et al. Clinical and economic impact of empirical extended-infusion piperacillin-tazobactam in a community medical center. Ann Pharmacother. 2015;49(7):754–760. Schmees PM, Bergman SJ, Strader BD, Metzke ME, Pointer S, Valenti KM. Outcomes of an extended-infusion piperacillin-tazobactam protocol implementation in a community teaching hospital adult intensive care unit. Am J Health Syst Pharm. 2016;73(11 Suppl 3):S100–S105. Bao H, Lv Y, Wang D, Xue J, Yan Z. Clinical outcomes of extended versus intermittent administration of piperacillin/tazobactam for the treatment of hospital-acquired pneumonia: a randomized controlled trial. Eur J Clin Microbiol Infect Dis. 2017;36(3):459–466. Cotrina-Luque J, Gil-Navarro MV, Acosta-García H, et al. Continuous versus intermittent piperacillin/tazobactam infusion in infection due to or suspected pseudomonas aeruginosa. Int J Clin Pharm. 2016;38(1):70–79. Zelenitsky S, Nash J, Weber Z, Iacovides H, Ariano R. Targeted benefits of prolonged-infusion piperacillin-tazobactam in an in vitro infection model of Pseudomonas aeruginosa. J Chemother. 2016;28(5):390–394. Nichols K, Chung EK, Knoderer CA, et al. Population pharmacokinetics and pharmacodynamics of extended-infusion piperacillin and tazobactam in critically ill children. Antimicrob Agents Chemother. 2016;60(1):522–531. Lyu Y, Yang Y, Li X, et al. Selection of piperacillin/tazobactam infusion mode guided by SOFA score in cancer patients with hospital-acquired pneumonia: a randomized controlled study. Ther Clin Risk Manag. 2017;14:31–37. Cutro SR, Holzman R, Dubrovskaya Y, et al. Extended-Infusion versus standard-infusion piperacillin-tazobactam for sepsis syndromes at a tertiary medical center. Antimicrob Agents Chemother. 2014;58(8):4470–4475. Fan SY, Shum HP, Cheng WY, Chan YH, Leung SM, Yan WW. Clinical outcomes of extended versus intermittent infusion of piperacillin/tazobactam in critically ill patients: a prospective clinical trial. Pharmacotherapy. 2017;37(1):109–119. Felton TW, Goodwin J, O’Connor L, et al. Impact of bolus dosing versus continuous infusion of Piperacillin and Tazobactam on the development of antimicrobial resistance in Pseudomonas aeruginosa. Antimicrob Agents Chemother. 2013;57(12):5811–5819. Bauer KA, Gentene AJ, West JE, Shidham G, Goff DA. An antimicrobial stewardship program’s evaluation of the safety and efficacy of continuous infusion of nafcillin in the treatment of methicillin-sensitive staphylococcus aureus bacteremia. Infect Dis Clin Pract. 2013;21(2):111–113. Cai Y, Bai N, Liu X, Liang B, Wang J, Wang R. Pharmacokinetic/pharmacodynamic research on three different infusion time regimens of linezolid in healthy Chinese volunteers. Int J Clin Pharmacol Ther. 2015;53(9):765–771. De Pascale G, Fortuna S, Tumbarello M, et al. Linezolid plasma and intrapulmonary concentrations in critically ill obese patients with ventilator-associated pneumonia: intermittent vs continuous administration. Intensive Care Med. 2015;41(1):103–110. Tafelski S, Nachtigall I, Troeger U, et al. Observational clinical study on the effects of different dosing regimens on vancomycin target levels in critically ill patients: continuous versus intermittent application. J Infect Public Health. 2015;8(4):355–363. van Maarseveen EM, Gipmans S, Vasbinder E, Petjak M, van Zanten AR. Switching from intermittent to continuous infusion of vancomycin in critically ill patients: toward a more robust exposure. Ther Drug Monit. 2016;38(3):398–401. Hong LT, Goolsby TA, Sherman DS, et al. Continuous infusion vs intermittent vancomycin in neurosurgical intensive care unit patients. J Crit Care. 2015;30(5):e1–e6. Lin H, Bukovskaya Y, de Moya M, Lee J, Schmidt U. Vancomycin continuous infusion versus intermittent infusion during continuous venovenous hemofiltration: slow and steady may win the race. Ann Intensive Care. 2015;5:10. Schmelzer TM, Christmas AB, Norton HJ, Heniford BT, Sing RF. Vancomycin intermittent dosing versus continuous infusion for treatment of ventilator-associated pneumonia in trauma patients. Am Surg. 2013;79(11):1185–1190. Hanrahan T, Whitehouse T, Lipman J, Roberts JA. 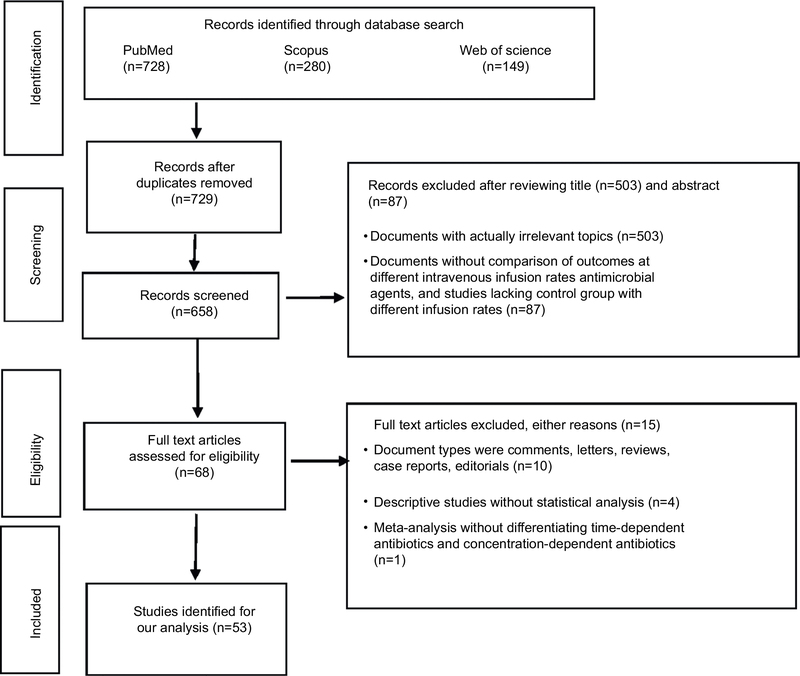 Vancomycin-associated nephrotoxicity: A meta-analysis of administration by continuous versus intermittent infusion. Int J Antimicrob Agents. 2015;46(3):249–253. Hao JJ, Chen H, Zhou JX. Continuous versus intermittent infusion of vancomycin in adult patients: a systematic review and meta-analysis. Int J Antimicrob Agents. 2016;47(1):28–35. Wu Y, Kang J, Wang Q. Drug concentrations in the serum and cerebrospinal fluid of patients treated with norvancomycin after craniotomy. Eur J Clin Microbiol Infect Dis. 2017;36(2):305–311. Albiero J, Sy SK, Mazucheli J, et al. Pharmacodynamic evaluation of the potential clinical utility of fosfomycin and meropenem in combination therapy against KPC-2-producing Klebsiella pneumoniae. Antimicrob Agents Chemother. 2016;60(7):4128–4139. Hohmann N, Kreuter R, Blank A, et al. Autoinhibitory properties of the parent but not of the N-oxide metabolite contribute to infusion rate-dependent voriconazole pharmacokinetics. Br J Clin Pharmacol. 2017;83(9):1954–1965. Moriyama B, Kadri S, Henning SA, Danner RL, Walsh TJ, Penzak SR. Therapeutic drug monitoring and genotypic screening in the clinical use of voriconazole. Curr Fungal Infect Rep. 2015;9(2):74–87. Raverdy V, Ampe E, Hecq JD, Tulkens PM. Stability and compatibility of vancomycin for administration by continuous infusion. J Antimicrob Chemother. 2013;68(5):1179–1182. Tran A, O’Sullivan D, Krawczynski M. Cefepime intravenous push versus intravenous piggyback on time to administration of first-dose vancomycin in the emergency department. J Pharm Pract. 2017;897190017734442. Kidd JM, Avery LM, Asempa TE, Nicolau DP, Kuti JL. Physical compatibility of meropenem and vaborbactam with select intravenous drugs during simulated Y-site administration. Clin Ther. 2018;40(2):261–269. Franceschi L, Cojutti P, Baraldo M, Pea F. Stability of generic meropenem solutions for administration by continuous infusion at normal and elevated temperatures. Ther Drug Monit. 2014;36(5):674–676. Carlier M, Stove V, Verstraete AG, de Waele JJ. Stability of generic brands of meropenem reconstituted in isotonic saline. Minerva Anestesiol. 2015;81(3):283–287. Ling J, Gupta VD. Stability of nafcillin sodium after reconstitution in 0.9% sodium chloride injection and storage in polypropylene syringes for pediatric use. Int J Pharm Compd. 2000;4(6):480–481. Vijayakumar A, Sharon EV, Teena J, Nobil S, Nazeer I. A clinical study on drug-related problems associated with intravenous drug administration. J Basic Clin Pharm. 2014;5(2):49–53. Ehsani SR, Cheraghi MA, Nejati A, Salari A, Esmaeilpoor AH, Nejad EM. Medication errors of nurses in the emergency department. J Med Ethics Hist Med. 2013;6:11. Cotta MO, Dulhunty JM, Roberts JA, Myburgh J, Lipman J. Should β-lactam antibiotics be administered by continuous infusion in critically ill patients? A survey of Australia and New Zealand intensive care unit doctors and pharmacists. Int J Antimicrob Agents. 2016;47(6):436–438. Hohlfelder B, Kubiak DW, Degrado JR, Reardon DP, Szumita PM. Implementation of a prolonged infusion guideline for time-dependent antimicrobial agents at a tertiary academic medical center. Am J Ther. 2016;23(6):e1768–e1773. Heinrich LS, Tokumaru S, Clark NM, Garofalo J, Paek JL, Grim SA. 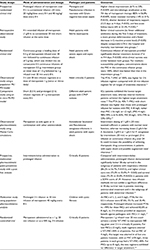 Development and implementation of a piperacillin-tazobactam extended infusion guideline. J Pharm Pract. 2011;24(6):571–576. Maddox ML, DeBoer EC, Hammerquist RJ. Administration of extended infusion piperacillin-tazobactam with the use of smart pump technology. Hosp Pharm. 2014;49(5):444–448.